It had to happen sometime – even computers are not immortal. The Figures of Speech computer had been processing verbal rubbish (go on, say it: 'garbage in – garbage out') for eight years without complaint. Even the 2016 assault by Microsoft trying to trick its customers into upgrading to Windows 10 had been repelled after a year-long battle. We were a team. We could take on the world together. Well – until last Thursday morning that is, the moment when the team spirit evaporated. As the liquid began to work its magic, the onlookers thought back to those early days when that motherboard had been the cool newcomer, the 'Ultra Durable 3' with a 'hybrid silent-pipe module'. Well it turned out that the 'ultra durable' endured eight years. Is a computer year perhaps the equivalent of ten human years? As for the 'silent pipe module', it had stayed silent during that time and no one could remember any more what it did. The motherboard finally slipped into the timeless zone, taking its silent pipe with it into timeless silence, too. Along with the 'i7 LGA1366-socket' CPU and '32 GB of DRAMM3' memory modules, because – as any fool knows – after eight years no one makes motherboards that accommodate LGA1366 socket processors, let alone use DRAMM3 memory modules, which also means that the flashy CPU water-cooled system will no longer fit anything else. How could we be so stupid to even think that? So Dignitas had a bit of a rush on its hands last Friday: a gibbering motherboard, a useless CPU, eight redundant memory modules and a CPU cooling system. The wonder of capitalism: one small error in one small peripheral chip somewhere leads to mass euthanasia. My father would have taken it into the shed and set about it with screwdriver and hammer, returning it, good as new, within the hour. The wonder of capitalism: the postlady brought their successors on Friday, before their beds had even cooled. The Figures of Speech computer is just too important for the observance of respectful mourning periods. It all started out so well. Everything fitted together as it was supposed to. The 'rig' – that's what it's called these days, by the way – even started at the first attempt, the motherboard became a disco of flashing lights, the boot screen a work of art which informed the owner of the temperature of every bit, the speed of the fans and all the overclocking it was prepared to do for you. A 13-year-old would have been delighted. Of course that is how the technology strumpet works: the initial fascination, then the exchange of a substantial sum of money, empty promises, then the exchange of an even more substantial sum, some exciting teasing, then, if you are lucky, a brief flash of disco-lighting, a quick fumble and that's it. But once you foolishly believe that you have bent the strumpet to your will, the pain begins. You are in a place of hidden sharp things: metal edges and vicious pointy things that resent being touched, let alone grasped. #MeToo! they shout, one after another. The motherboard manufacturer had supplied a 'Quick Start Guide'. Each of the first eight of the nine steps was indeed quick. They were all of the form 'Plug X into Y' and took less than a few minutes. The ninth step was 'Power on the system and install operating system and drivers'. Time required: all in all around three days. In this guide to the gamers' paradise, the case of a user with an existing operating system and data was not covered. All the advice found on the internet turned out to be at best worthless, at worst foolishly incompetent. 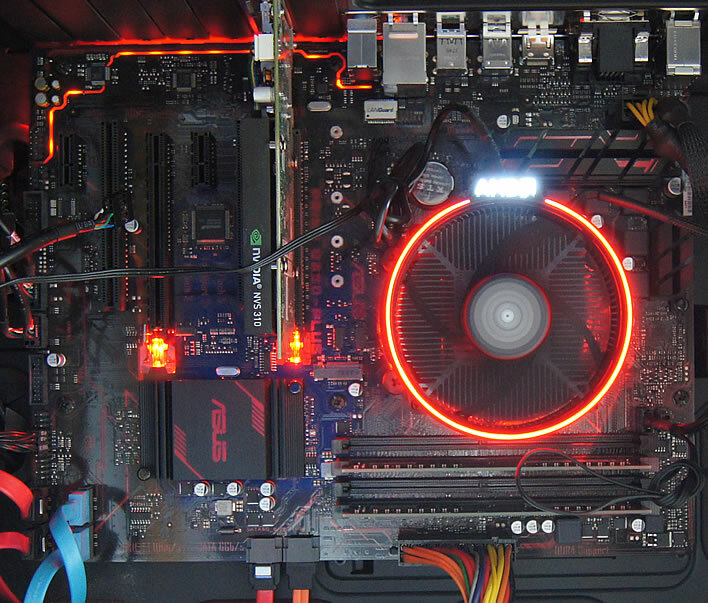 The beautiful new motherboard has something called a UEFI boot system, the replacement for the old-style BIOS. This started the Windows 7 operating system from the old system drive, but stopped at the login screen. What a tease! A fine tease, too, because neither mouse nor keyboard had any effect. The reader will be spared the technical details of the titanic struggle with this pouting strumpet that took up the entire weekend and more. There was much promise and many hopes, some fulfilled, many dashed; many prayers (rarely answered), equally many shouts of joy and agony; much absent-minded chewing of food at mealtimes; much hurried fumbling, far too much screwing, bits shoved in and pulled out all too quickly afterwards; there was anger and there were even threats of violence; data was lost, recovered, reloaded, lost again and recovered. Oh… and a chasm of the deepest, blackest despair opened. Will this psychopath ever work for me again? The redlight district, filled with alluring danger. There is no fool like an old fool. Next time it won't be the computer that is sent off to Dignitas. Among the multiple unexpected consequences of our motherboard replacement, the most unexpected has been Microsoft's refusal to support Windows 7 on the new hardware. Windows Update now refuses to check for updates, displays instead a large message that 'this hardware is unsupported' and requires a 'newer version of Windows'. Even more surprising is the appearance of the same messages along with a refusal to download new definition updates for Microsoft's own anti-virus products. The patches created by some users to get round this problem are still very much cavalier work in progress, with the user being the chief tester. No rational user who needs a reliable system would install these in their present state of development. The reliable solution is the tried and tested one that was first used when HAL 9000 started playing up on that mission to Jupiter in 2001: we float through Windows 7 pulling out modules – Windows Update, MS Security Essentials, Windows Defender – until the nuisance disappears. A zen-like calm now fills our minds, now that we realise just how much heartache these modules have caused over the years. Now we can complete our mission in peace, dear Figures of Speech readers.